JUPITER — A plan to pay up to $5,000 to residents still living in the Suni Sands mobile home park on A1A drew sharp criticism from park owner Charles Modica. “The town is rewarding those who have stayed despite the eviction notices. It’s not fair to people who complied by the rules and already left,” said Modica, who plans to build and inn and Key West-style marketplace on the 10-acre property fronting the Jupiter Inlet. Modica bought the property for $17 million two years ago. Residents got eviction notices last November. They were supposed to be out by April 30. About three dozen of the original 100 mobile homes remain occupied. Some lots are vacant. Grills, bicycles, lawn equipment and other remnants of daily life are scattered in driveways on the lots with boarded up mobile homes. While the park is technically closed, Modica said has allowed residents to stay. Suni Sands resident Joyce Miller, 67, who with her husband Charles, 83, still lives in her Suni Sands mobile home, said the $5,000 is not enough to help elderly residents like her relocate. She and Charles have used up their savings to buy a “derelict trailer with holes in the roof.” They plan to move to a trailer in Hobe Sound. 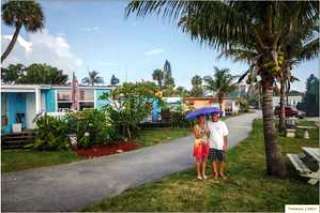 Suni Sands residents Dave and Deb Cooper near their mobile home in the park on A1A in 2014. Miller said $5,000 is not enough to allow her and her husband to be able to buy a decent mobile home and move. About $35,000 would be necessary. Miller said she would not qualify under the town’s requirements for the payment. “This is devastating. (Suni Sands) was going to be our retirement home. We made friends here. We looked out for each other here. At our age, how are we expected to start over?” she said. Suni Sands residents must meet income and other requirements to qualify, according to the Jupiter proposal expected to be discussed at Tuesday’s 7 p.m. council meeting. Suni Sands residents have filed a court suit saying the sale of the park should be voided. Residents were not and should have been given first refusal to buy the property, according to the suit pending in Palm Beach County Circuit Court. Attorneys representing Modica countered that, among other reasons, the sale is legal because the property was in foreclosure when Modica it. “There is no statutory foundation for requiring prior notice for property in foreclosure,” said Geoffrey Jones, an attorney representing Modica, said at a court hearing in April. Several residents have complained that the vacant mobile homes are being broken into and crime is increasing since eviction notices were delivered. Non-residents have taken up living in the park, according to town records. Modica plans a non-gated community with a 200-room hotel, retail space and underground parking. Current zoning limits building height to three stories. Plans have not been filed with the town. Suni Sands residents own their mobile homes. They pay about $650 a month to rent their lots. Utilities, garbage pickup and cable are included. Suni Sands residents must meet these requirements in order to receive Jupiter’s proposed money.